The traditional Shoo Fly quilt block pattern is a perfect choice when you’re looking for a beginner friendly patchwork design. The block's corners are made from half square triangle units, and we’ll quick piece them to avoid handling the fabric's stretchy bias. To make my block, I combined a grass-like green background with a pictorial print that depicts fruits and vegetables. I fussy-cut the center square to position the pictorial just where I wanted it. A window template can help you preview the image that will be visible after seams are sewn, but it's easy to preview fabrics with your rotary ruler, too, just visualize the square minus 1/4" around its edges. I've included cutting instructions for three different Shoo Fly sizes, a 12-inch square block, a 6-inch block (perfect for baby quilts) and a 3-inch miniature quilt block. Shoo Fly makes a wonderful scrap quilt, but if you don't go scrappy, consider changing the background fabric of blocks that will be sewn side-by-side. Otherwise, you'll end up with like-fabrics meeting like-fabrics along straight edges and at corners -- mixing it up a bit gives the quilt a bit more visual movement as patches flow across the quilt top. You can mix it up even more by sewing alternate blocks between the Shoo Fly blocks -- to keep it simple, try a Snowball quilt block. If you're a beginning quilter, be sure to practice your quarter-inch seam allowance skills before you sew a quilt block. Read the half square triangle unit instructions before cutting fabrics for the miniature block. You might decide to enhance accuracy by cutting squares for those units a bit larger than necessary, and then trimming the units back after assembly. The pictorial fabric is illustrated as dark green. Draw a diagonal line, from one corner to the opposite corner, on the reverse side of each light green square. 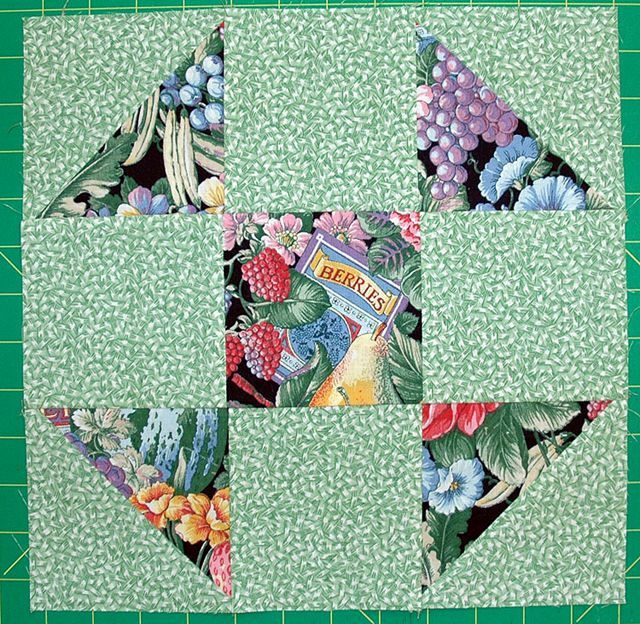 Use the quick pieced half-square triangle method to sew a light square to a pictorial square of the same size. Slice apart as explained and press. Repeat. When complete, each of the four resulting half-square triangle units should measure 4-1/2” x 4-1/2” for the 12-inch square block (2-1/2" x 2-1/2" for the 6-inch square block and 1-1/2" x 1-1/2" for the 3-inch square block). Arrange all units to create three rows as shown, left illustration. Half square triangle units are at the ends of top and bottom rows and the remaining pictorial square is at the center of the middle row. Be sure that light green squares touch the center square in all rows. Sew the units in each row together. Press all seam allowances towards the light green squares. Sew rows together, carefully matching patch edges and seam intersections (Figure 2). Press. The largest Shoo Fly quilt block should measure 12-1/2” x 12-1/2” (Others, either 6-1/2" x 6-1/2" or 3-1/2" x 3-1/2" for the mini).